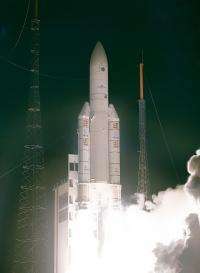 (PhysOrg.com) -- In the early hours of 1 March 2002, the largest Earth observation satellite ever built soared into orbit from ESAs launch base in Kourou, French Guiana. For a decade, Envisat has been keeping watch over our planet. The eight-tonne satellite has doubled its planned five-year lifetime, circling Earth more than 50 000 times. With ten sophisticated optical and radar sensors, the satellite is continuously observing and monitoring Earths land, atmosphere, oceans and ice caps. An estimated 2000 scientific publications have been based on this information. Envisats largest instrument is the Advanced Synthetic Aperture Radar, which can be used day or night because it sees through clouds and darkness. This is particularly useful over polar regions, which are prone to long periods of bad weather and extended darkness. Last summer, the radar monitored record-low sea ice cover in the Arctic. The Medium Resolution Imaging Spectrometer  or MERIS  captures images of ocean color and land cover. MERIS images are used to produce high-resolution global land-cover maps under the GlobCover project. These maps are useful for modelling the extent and effects of climate change, conserving biodiversity and managing natural resources. 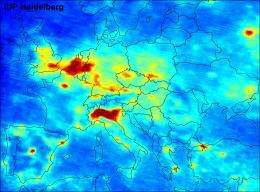 Envisats MIPAS, Sciamachy and GOMOS suite of sensors is able to see the holes in the thinning ozone layer and the plumes of pollutants hanging over major industrial cities or burning forests. 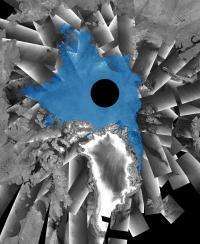 They can simultaneously observe the atmosphere in ways the human eye cannot, producing detailed horizontal and vertical cross-sections of a series of chemical components. Working like a thermometer in the sky, Envisats Advanced Along-Track Scanning Radiometer measures thermal-infrared radiation to take the temperature of Earths land and sea surfaces. The ATSR World Fire Atlas is one useful product. Envisat provides crucial Earth observation data not only to scientists, but also to many operational services such as sea ice mapping or oil spill monitoring. High engineering and scientific skills keep the mission going  Envisat owes its decade of success to over ten years of teamwork. With an increased demand from scientific users for Envisat products, the mission gradually increased the flow of data within the first five years. Ground facilities have improved over the years to speed the delivery of data and their quality. In 2004, the missions first scientific results were presented at the Envisat Symposium in Salzburg, Austria. With about 1000 participants, it marked the establishment of Envisat as one of the major tools available to Earth scientists. Three years later, another symposium dedicated to Envisat included the first global measurements of greenhouse gases, demonstrating the fast-growing concentration of carbon dioxide and the seasonal variation of methane. In 2010, the satellites orbit was changed to allow Envisat to continue operating for at least another three years. This is ensuring the continuity of crucial Earth-observation data until the next generation of satellites  the Sentinels  are fully operational in 2013. The Sentinel missions are being developed as part of Europes Global Monitoring for Environment and Security (GMES) program. 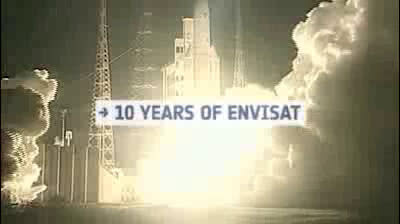 For more Envisat achievements, visit Envisats tenth-birthday minisite.